Get Creative With Your Summer Hair and Nails! How’s your summer going? Mine is hot, hot, hot! Do you have your summer look down yet? I’m still experimenting with makeup, hair and nails (as always)! You can use these fun hair and nail products below to put the finishing touches on your summer look. Colour Bunz ($19.99 a box) — Introducing Colour Bunz, one-of-a-kind hair coloring product that reinvents the traditional process and offers a cost-effective, comfortable, effective and fun way to color hair. The videos also demonstrate color placement and application tips. Colour Bunz enables an at-home coloring process that is weightless and pain-free, and eliminates all possibility of color running or drying out. In addition to use at home with professional results, Colour Bunz can be used by professionals in salons as a fun, new technique to color hair other than using foils. Those looking to revamp their hair style can do so easily, save money, and in a comfortable manner. The product is environmentally friendly and puts a huge dent in the waste from the foils that take over landfills all over the world. 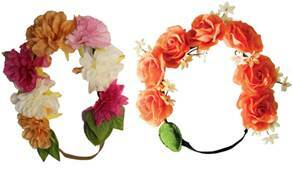 Mia Beauty’s Flashion Flowers ($19.99 USD) — This summer, dress up any outfit with a little light! Take the floral halo trend in a bright new direction with Mia Beauty’s new Flashion Flowers, now available at ULTA, Claire’s and Icing stores. The Flashion Flowers are threaded with an LED light and small battery pack hidden in the leaf design. Simply remove the plastic pull tab and press the leaf to change the lighted flowers from fast flashing lights to slow flashing lights, to constant light. 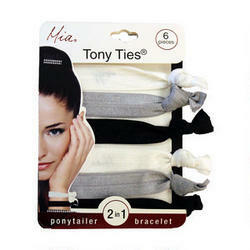 Mia Beauty Tony Ties ($6 USD for a pack of solid color ties) — Sleek, functional, and great for a quick ponytail. These no-tug hair ties are comfortable and will not leave a crease in hair. Wear them as bracelets to ensure that you always have a hair tie when you need one. 6 fashionable hair ties in each pack. Salon Perfect Neon POP ($3.98 each) — Neon nails are the it manicure look for summer with eye-dazzling digits ruling from the catwalk to the boardwalk. Let your fingertips feel the energy of a high-voltage shade with Neon POP, a new collection of vibrant, neon lacquers from Salon Perfect®. Whether you’re just dabbling in a highlighter bright hue or living the full-on Technicolor dream, these 12 bright and bold neon shades will POP out from the rest. Did you know that the most common blends that you’ll see your colorist mix when at the salon are NOT the ones you’ll find on the shelf for at-home color? Well, the John Frieda® Hair Care experts have been working to fix this problem… enter the New Precision Foam Colour Salon Blends! I have dark brown hair (my color is 4BG — Dark Chocolate Brown), but I would recommend these blends, just from the fact that this is fab home hair color. It evenly colors hair (no weird off-color patches) and leaves hair shiny and gorgeous! It covers pesky grays well, too! Each cost $12.99 and can be found at food, drug and mass retailers nationwide. Enjoy! Looking to update your hair this fall? Try a new, darker color, a new color-enhancing shampoo, or a fun hair extension. Below are some fun products that will help you look fabulous! Kelly Van Gogh MASTER BLEND Multi-Dimensional Luxury Hair Colour Kit ($49.00 USD) — Kelly’s proprietary cold pressed caviar oil delivery system is rich in omega-3 fatty acids, vitamin A, C, and D, and amino acids. Combined with amino acids and keratin proteins, the formula also replenishes weakened hair fibers and stimulates collagen growth needed to grow and strengthen hair. Available in ten shades, the hair colour delivers 100% gray coverage with an ammonia alternative, MEA, which is very gentle on the hair. The MASTER BLEND Multi-Dimensional Luxury Hair Colour kit is simple and easy to use for a goof-proof application. The result is glossy, healthy hair with a beautiful and youthful shine. Available at www.kellyvangogh.com. L’Oréal Paris Féria Midnight Collection ($9.99 USD) — Féria introduces the new Midnight Collection to reinvent black hair color by revealing the nuances and undertones of this iconic, seductive shade. Custom-blended by master colorists, each shade shimmers with its own unique highlights and combines delicate tones and hints of tint to be visible, even on the darkest hair. Available at www.lorealparis.com and chain drug, food and mass market retailers. TouchBack Plus Color Shampoo($29.95): Cleanse hair and revive dull color with sulfate-freeMicro Foam™. Each wash adds a layer of shiny color to both natural and color-treated hair, while protecting hair from UVA/UVB damage, oxidation and fading. TouchBack Plus Color Conditioner($29.95): The perfect blend of hydration and color, this conditioner adds color to both natural and color-treated hair. TouchBack Plus Color Leave-In Conditioner ($29.95): This unique, patented Micro Foam™ treatment colors and conditions natural or color-treated hair anytime, anywhere. TouchBack Plus Clear ($24.95): Shampoo, Conditioner and Leave-In Conditioner can be alternated with the COLOR products to maintain your optimum color level, while providing superior fade protection, hydration and shine. Available in eight shades: Rich Black, Dark Brown, Medium Brown, Light Brown, Ash Blonde, Golden Blonde, Light Auburn and Dark Auburn. Visit www.touchbackplus.com to learn more. POP Clip-In Animal Print Strips ($10.00 USD) Extensions that let you embrace your inner tiger. Celebrities on and off the red carpet have been spotted sporting theseason’s must-have hair trend: animal print extensions. Take a walk on the wild side and try out the trend cruelty-free with POP Clip-In Animal Print Strips, one-inch clip-in extensions that give hair a fierce effect. Each bright strip offers 16 inches of color that pops for standout hair that gets noticed. A part of POP’sFreestyle Collection, Animal Print Strips are made with Tru2Life ® Heat-Friendly hair. The versatile strips can be curled or straightened with thermal styling tools just like your own hair, complementing any style you create. Choose from six fun and ferocious patterns or mix and match multiple to express yourself through your hair. Surya Brasil Henna Cream ($11.99 USD) is renowned as the #1 selling semi-permanent hair coloring system in Brazil. It comes in 15 exciting shades that will last up to seven to ten washes! Henna Cream is touted as the safest way to color your hair and can be used on chemically treated and color treated hair. Packed with essential oils, this Henna Cream will keep your hair structure intact as it locks in moisture and leaves your hair smelling deliciously fresh! What I think: The first thing I noticed when I colored my hair was the scent. It is light and herbal, but not chemical smelling AT ALL. Seriously. I also liked how easy it was to use. There was no combining products — this is just one liquid that you apply with gloves that are included. It took a little bit to get used to because it dripped a bit, but once you rub it in, it stays put. 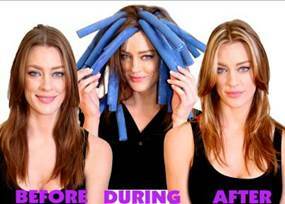 The product also includes a plastic hair cap to use while you are waiting for the color to work. Nice! My results were pretty good. The color is great. I use dark brown which matched my natural color. It covered well, but a few of my grays are still showing. But, for a natural hair color, it works very well. Availability: Whole Foods Market nationwide. Enjoy! Now Natural Instincts with new Week 2 Color Refresher has a solution to love. The Week 2 Color Refresher replenishes the tones your hair color loses first and can simply be applied two weeks after coloring to give hair a color boost. The color boost is included in the traditional Natural Instincts demi-permanent as well as the new permanent Vibrant formula. Now you can get up to 8 weeks of vibrant, healthy-looking hair color from Natural Instincts. New Natural Instincts Vibrant is a 10-minute formula that delivers stunning color with 100% gray coverage. What I think: I have used Natural Instincts before and liked it, but because it is semi-permanent, the gray coverage never lasted long. The vibrant color is permanent and so lasts a very long time. I also love the idea of the color boost. I applied it after two weeks and my hair appeared brighter and my color looked fresher. Awesome! Natural Instincts is available at mass market retailers near you. Enjoy! Join Me in The John Frieda At Home Hair Colour Challenge! Recently John Frieda® launched their first-ever permanent hair colour –Precision Foam ($12.99 USD). Easy to apply, the non-aerosol foam formula spreads evenly through hair, saturating every strand completely—even the back of the head, roots and hairline. The 20-shade palette collection was developed in conjunction with the John Frieda® Creative Colour Director, and sought-after U.K. colourist, Nicola Clarke, who is responsible for some of the most iconic hair colours in Hollywood. With an array of options for blondes, brunettes and redheads, the collection brings a salon shade spectrum home.No mess, no drips,no stains—just gorgeous hair from every angle. The revolutionary colour even provides 100% grey coverage and vibrant shine with long-lasting results, offering salon precision at home. HOW TO USE:Squeeze the center of the bottle to dispense foam into a gloved hand and apply directly to hair. Simply massage foam into hair with fingertips to thoroughly cover each strand from root to tip. The foam easily coats even the most hard-to-reach areas, including the back of the head. Let stand for 20 minutes (30 minute for grey coverage) and rinse with lukewarm water until water runs clear. Apply conditioner and leave in for 2-5 minutes before rinsing. I can only accept readers from the United States and Canada. Are you interested in trying it? If so, leave a comment or email me at lorena.emerson@gmail.com telling me if you want to color your hair to cover greys or change your color (I want a selection for the review). Also let me know what shade you would like to try. If I choose you, I would need you to color your hair within a week of receiving the product and I would like before and after photos that show your transformation that I can use on my blog. I would also like your thoughts on the process. So let me know if you wat to join me in this challenge! I usually cover my grays at home. Of course it is much less expensive than going to a salon, but these days new formulas make it fairly easy, too! Like traditional colorants, the tint and developer come separately in liquid form, but they mix and combine easily in the custom-designed foamer bottle. To produce the foam, simply shake the mixture with the cap on. Then using the foamer top, squeeze the foam into your gloved hand. The unique foamer bottle helps ensure control and consistency of the foam throughout the coloring process. When you squeeze it from the bottle, it stays in your gloved hand without dripping. Then simply use your fingertips to work it into your hair for ultimate precision. Color Blend Foam gives you six times more product volume versus a traditional liquid or crème colorant, offering effortless and complete coverage. With Color Blend Foam, it’s easy to cover every strand over your entire head. Once it is applied to your hair, your hair’s natural oils collapse the foam. The resulting liquid is drawn through the hairs, allowing the color to penetrate hair quickly and evenly from root to tip. Color Blend Foam will not begin to collapse until it’s applied to your hair. I really liked using this formula. Once I combined the tint and developer, I shook it up, then squeezed the bottle and the foam appeared. I then applied it first to my scalp and then all over with my gloved hands. It was very fast and easy. I then wiped the excess away from my hairline and temples and it stayed in place for the 25 minutes it took to develop. After I rinsed it out and dried my hair, I was left with a rich color that entirely covered my grays! You can purchase this fab hair color at a drugstore or mass market retailer near you. Enjoy!